affordable prices, 2-3 times a week repetitive wear performance, and professional appearance. Staff, cool and comfortable to wear especially in warm climates, easy to wash, quick to dry and wear. Womens are available in Short Sleeve and 3/4 Sleeve. Mens are available in Short Sleeve (13 colours) in Sizes SM-4XL. Mens also available in BLACK Long Sleeve . Fabric is 100% Breathable Polyester. 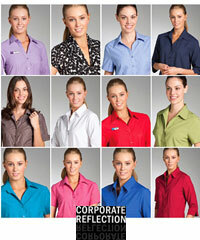 Stock Service Shirts-12 shirts per delivery minimum. Embroidery service is available if required- see details below. Discounts apply on MOQ (Minimum Order Quantity) of 20 pcs. Shirts can be priced on combination of Mens and Womens. We will confirm details for you based on your requirements. Your logo can also be used on all other Corporate Profile products in the future. Allow 3 to 4 weeks. For urgent deliveries please advise your deadline and we will try to assist you.